A Rancor is a figure from Star Wars released in 2013. One was owned by Jabba the Hutt and was housed in the bottom of his palace. The Rancor species were originally from the planet Dathomir, home planet of Asajj Ventress. Jabba's Rancor was given to him as a birthday present from Bib Fortuna. When the crime lord attempted to execute Luke Skywalker by dropping him into the Rancor pit, Luke killed the Rancor by crushing it under a large portcullis, piercing and crushing it's skull, causing Jabba to instead try and execute him and his friends at the Sarlacc pit. Later, Luke said he was sorry to kill the poor creature, but decided it was best to put it out of its misery, as it was half-starved and was impossible to relocate it. The Rancor was a boss on the first level of Episode VI in both LEGO Star Wars II: The Original Trilogy and LEGO Star Wars: The Complete Saga. It has three hearts and cannot be damaged by Blasters or Lightsabers. He is also playable in LEGO Star Wars: The Complete Saga in the Episode I Minikit Bonus, only if the player turns on Extra Toggle. In Lego Star Wars II: The Original Trilogy, a Baby Rancor appears as a playable character. With a Gammorean Guard in its mouth. A rancor as it appears in the video games. 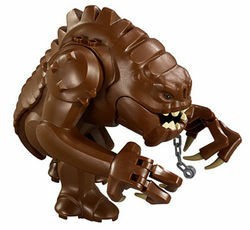 The Rancor in LEGO Star Wars: The Force Awakens. This page was last edited on 6 July 2016, at 03:54.